Kjärstad, J. ; Johnsson, F. ; Skagestad, R. et al. (2015). Recommendations on CO2 transport solutions. Göteborg: Chalmers University of Technology. Kjärstad, J. ; Bisaillon, M. ; Harvey, S. et al. (2015). Transforming the energy system in Västra Götaland and Halland – linking short term actions to long term goals. Göteborg: Chalmers University of Technology. ISBN/ISSN: 978-91-980974-6-7. Lundahl, O. & Kärkkäinen, A. (2015). An investment model of a future CO2 free district heating system - Evaluation of the district heating system in Gothenburg in the year 2030, Chalmers University of Technology, Göteborg. 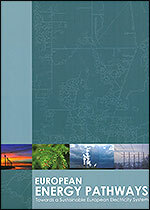 This is the second book reporting on the progress and results of the research programme "Pathways to Sustainable European Energy Systems", covering the period 2010-2013. Goop, J. (2015). The roles of transmission and distribution networks in integrating variable renewable electricity generation. Licentiate thesis. Chalmers University of Technology. Nyholm, E. (2015). Demand response and distributed solar generation in the Swedish residential sector – A techno-economic evaluation. Chalmers University of Technology. Licentiate thesis. Reichenberg, L. (2015) Dampening variation in the European wind energy system : a geographic allocation model using multi-objective optimization. Licentiate thesis Chalmers University of Technology. Licentiate thesis. Rootzén, J. (2015). Pathways to deep decarbonisation of carbon-intensive industry in the European Union - Techno-economic assessments of key technologies and measures. Göteborg: Chalmers University of Technology. ISBN/ISSN: 978-91-7597-226-8. PhD thesis. Sundquist, J., & Esmailnajad, S. (2014). Demand side management in Swedish industry - an investigation of load management in major Swedish industries. Chalmers University of Technology, Göteborg. Master thesis. Johansson, D. (2013). System studies of different CO2 mitigation options in the oil refining industry: Post-combustion CO2capture and biomass gasification. Doctoral Thesis. Chalmers University of Technology. Schaad, G. (2012). Strategies for Environmental Sustainability of Municipal Energy Companies. Pathways of Sustainable Development between Business and Society. Doctoral thesis. Gothenburg University. Rootzén, J. (2012). Reducing Carbon Dioxide Emissions from the EU Power and Industry Sectors - An assessment of key technologies and measures. Göteborg: Chalmers University of Technology. Ó Broin, E. (2012). Modelling energy demand in the buildings sector within the EU. Göteborg: Chalmers University of Technology. Jönsson, J. (2011). Analysing different technology pathways for the pulp and paper industry in a European energy systems perspective. Doctoral Thesis. Chalmers University of Technology. Mata, É. (2011). Energy efficiency and carbon dioxide mitigation in building stocks. Licentiate thesis. Chalmers University of Technology. Pihl, E. (2010). Integrating Biomass in Existing Natural Gas-Fired Power Plants. Licentiate thesis: Chalmers University of Technology. Schaad, G. (2010). Corporate strategies to mitigate climate change- two essays on practices in Swedish energy-intensive companies. Göteborg: University of Gothenburg. Pettersson, M. (2008) Renewable energy and the function of law : a comparative study of legal rules related to the planning, location and installation of windmills. Doctoral thesis. Luleå University of Technology.